Today I am blatantly plagiarizing from a post to The Option Club, a Yahoo group, by an experienced option trader, Michael Catolico. He’s an expert on adjusting option positions. He called the group’s attention to the first chapter of a book by Mark Houston and Kathy Cosley, Alpine Climbing: Techniques to Take You Higher (The Mountaineers Books, 2004) that he believes teaches traders more than most books written by financial experts. Since I have trouble even climbing a step ladder (yes, I’m acutely acrophobic), I had no need for the book. The excerpts I provide here come from the Google Books preview. Keep options open. “Any given decision can either maximize or limit other possible options in the future." Alpine climbers take on considerably more risk than traders. After all, traders lose only money; climbers can lose their lives. But the way to the top demands similar decision-making processes. The basic measure of risk is VaR. For instance, on this graph the area to the left of the red line is the value at risk. This gives you some number that you’re 99% sure is worse than what is going to happen. By using the GARCH model on historical data you can figure out what the variance is at this point in time. 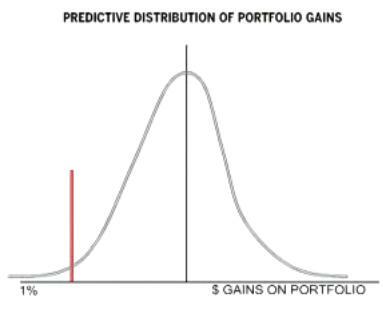 If it’s large, the portfolio curve gets pulled out; if it’s small, the portfolio curve gets pushed together. And the smaller it is, the less the value at risk. 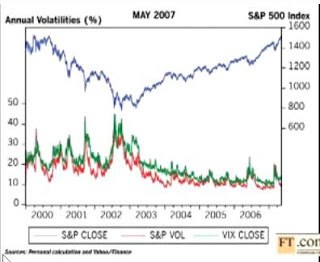 We can see that between 2003 and 2006 volatility was quite low. It’s just as low as it was in the middle 90s. So, despite perceived risk, volatility isn’t showing it. The red line is the S&P volatility; the green line is the VIX. 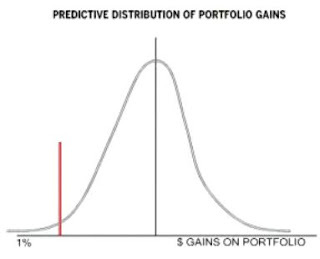 Mark H. Melin’s High-Performance Managed Futures: The New Way to Diversity Your Portfolio (Wiley, 2010) goes far beyond the standard asset allocation book. It not only makes the case for managed futures but does so from the perspective of risk. It is thorough and well documented, yet at the same time eminently practical. Both high net worth individual investors and financial advisors could profit from it. The most compelling reason to invest in managed futures is that they are not correlated to the equity market. For instance, managed futures had positive returns in nine of the past ten stock market declines. One caveat: these returns are based on the performance of indexes such as the Barclay CTA index and the CASAM CISDM index in which no one can invest. Instead, the investor’s return depends on the performance of individual commodity trading advisors (CTAs) who pursue a variety of strategies. There is no generic CTA, just as there is no generic hedge fund. Investors often think that they can mimic managed futures with ETFs. They have access to a broad spectrum of commodity ETFs, from agriculture to metals to energy. Although Melin doesn’t take on ETFs directly, he nonetheless defends his turf, explaining that managed futures generally show little correlation not only to stocks or hedge funds but “even the markets in which the CTAs trade.” (p. 148) CTAs can spread trade with different delivery months or slightly different products (such as feeder cattle and live cattle), they can hedge commodity futures with single stock futures, and they can pursue various option strategies. Since non-correlation is the key selling point of managed futures, Melin spends some time discussing proper correlation analysis. The traditional price correlation matrix, he contends, is faulty. As it relates to managed futures, “price correlation does not consider the CTA strategy or markets traded, which can be critical points of correlation in managed futures that are often not visible in traditional returns correlation.” As an example he cites the naked S&P option-selling strategy, which before the fall of 2008 had a 0.05 correlation to the S&P 500. 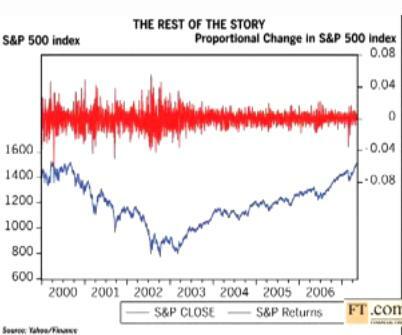 It looked “almost perfectly uncorrelated to the S&P but in fact the strategy was correlated and still is correlated to a catastrophic stock market collapse.” (p. 161) Melin maintains that the best correlation methodology includes five key ingredients: returns/price, strategy, market, time frame, and volatility. What would a well-diversified managed futures portfolio look like? It would include allocations to various strategies—for instance, 30% trend following, 10% countertrend, 20% volatility, 20% discretionary, 20% spread. Melin provides filters for choosing CTAs, starting with an average drawdown recovery time filter. I’ve just scratched the surface of this compelling book. Readers can also go to a website that has an assortment of data, reports, and academic studies as well as information on how to invest and financial advisor/introducing broker recommendations. A grammatical footnote: “managed futures” normally takes a singular verb, as in “What is managed futures?". I couldn’t bring myself to follow this convention. Long before I had ever heard of technical analysis I was involved in the production of a book that I considered the most obscure in a field of pretty obscure books. The exact title escapes me, but it was about Babylonian accounting. Little did I think that I’d ever revisit Babylonian financial recordkeeping. Then came the new book by Andrew W. Lo and Jasmina Hasanhodzic, The Evolution of Technical Analysis: Financial Prediction from Babylonian Tablets to Bloomberg Terminals (Bloomberg Press, 2010) where I learned that over the course of four centuries Babylonian diaries recorded the market prices of the same six commodities—barley, dates, mustard/cuscuta, cress/cardamom, sesame, and wool. Fascinating! It all goes to show how my own interests have evolved. The Evolution of Technical Analysis takes the reader on a whirlwind trip through history and across continents. Starting in the ancient world, progressing through the Middle Ages and the Renaissance, moving to Asia and then to the new world, the book proceeds to the “new age for technical analysis” exemplified by such luminaries as Dow and Gann, and finally looks at technical analysis today. It then offers a brief account of randomness and efficient markets and summarizes some academic approaches to technical analysis. The authors contend that pattern recognition may be the key to dealing with changing environments. The results of an online study that I referenced earlier on this blog “provided overwhelming statistical evidence (less than 1 percent probability of the findings being generated by pure chance) that humans can quickly learn to distinguish actual price series from randomly generated ones.” (p. 146) Since human pattern recognition skills outstrip those of any known algorithm, it may be possible, they argue, with the proper interface to “translate the hand-eye coordination of highly skilled video-gamers to completely unrelated pattern-recognition and prediction problems such as weather forecasting or financial trading.” (p. 129) I wonder what industry-standard terminals will look like in 2050! 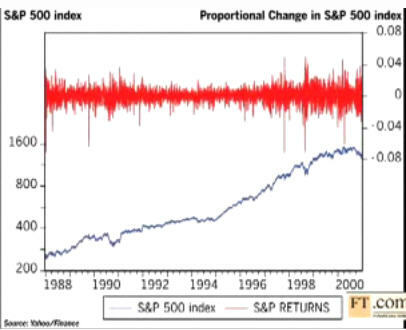 The most common way to measure volatility is to measure standard deviation over smaller periods of time—a week or a month. 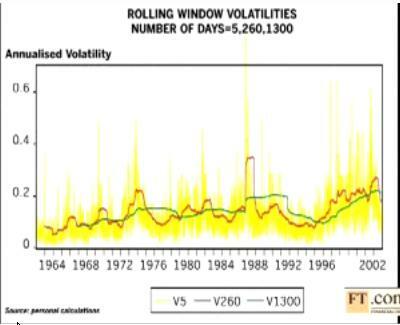 These measures of volatility are known as historical volatility. The problem is that if you use a short series you get a very noisy measure, and if you use a long series it’s so smooth that it doesn’t respond well to new information. 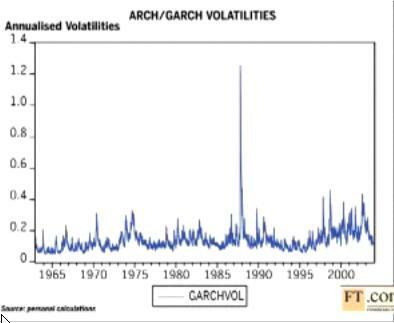 So, as an alternative to historical volatility you can use ARCH: autoregressive conditional heteroskedasticity. ARCH is a very simple concept, but Engle got the Nobel Prize in 2003 for inventing this model. ARCH uses a big window but weighted averages. That is, we’ll give more weight to recent information, less to those that happened a long time ago. You can estimate these weights using an econometric model. In yellow is the 5-day moving average of the standard deviations. In red is the one-year standard deviation, and the green is a five-year standard deviation. If you give the same information to a GARCH program (generalized autoregressive conditional heteroskedasticity) such as MatLab it will calculate the best set of weights. The GARCH bands are time-varying confidence intervals. For instance, at any one point in time you can say with confidence that the market isn’t going to be higher than the blue band or lower than the green band. For the transcript of the original presentation go to the FT Business School - NYU Stern School of Business site. Doug Hirschhorn is well known as a trading coach. In his latest book 8 Ways to Great: Peak Performance on the Job and in Your Life (Penguin Books, 2010) he presents eight principles employed by all top performers. They are: find your “why?”, get to know yourself, learn to love the process, sharpen your edge, be all that you can be, keep your cool, get comfortable with being uncomfortable, and make yourself accountable. The book is short (128 pp. ), but I think its brevity helps drive home its messages. And they are, it should be noted, messages directed first and foremost at traders. So the reader who is a trader doesn’t have to extrapolate from advice given to business leaders or athletes. All in all, a quick, worthwhile read. As always, the challenge is to act. Just as a person doesn’t lose weight by reading a diet book, so he doesn’t achieve peak performance by reading a book on becoming great. It’s comfortable to read a book, uncomfortable to stretch beyond one’s sometimes self-imposed limits. Yet we can all profit from being reminded now and again of what it takes to get beyond the middling. Some time ago (well, I guess the pre-crisis days of 2007 qualify as “some time ago”) Robert Engle, professor of finance and director of the Center for Financial Econometrics at NYU’s Stern School of Business as well as a Nobel Prize winner for his work on ARCH, gave a five-part “mini-course” on volatility on FT.com. The videos are, as far as I can ascertain, no longer available, but the transcripts are. However, the transcripts don’t include the graphics to which Engle refers. As is my wonkish wont, I took notes on this series; more important, I saved the graphics. Their quality was poor in the original, and capturing them with HyperSnap, pasting them into a Word document, and then extricating them so I could paste them into this blog certainly didn’t improve matters. But fuzzy is better than nothing. While I read the books I have here for review (including a 654-page tome on probability and statistics for finance which I am determined to implant in my brain) I plan to fill in the blanks by publishing my notes on these videos. Of course, for anyone who cares about this subject I highly recommend going to the original transcripts; they’re very brief and not at all technical, probably about two typed pages each. And, although I think I gave the link to NYU Stern’s Volatility Laboratory earlier, here it is again. It “provides real time measurement, modeling and forecasting of financial volatility, correlations and risk for a wide spectrum of assets.” It’s decidedly beta, and I suspect always will be. Interesting nonetheless. So, here are my notes on and the accompanying graphics from the first video. The red graphic indicates the amplitude of volatility. The periods when volatility is high are those when the market is in decline. 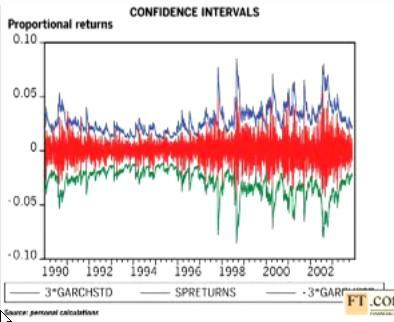 When the market is going up, as in the middle 1990s, volatility is low. Actually, in the mid-1990s volatility was at a record low. Volatility tends to mean revert. Indeed, in the late 90s volatility was very high, meaning that risk was high. And subsequently, of course, the market turned down. And we had high volatility as the market declined. 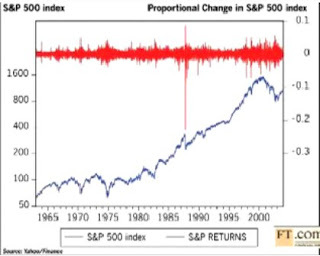 What we are calculating in this chart is the standard deviation of the returns on an annualized basis from 1997 to 2003. Since the broad index has a lower volatility than its components you see the benefits of diversification. The highest volatility on this chart is small caps. Every piece of information that tells us whether this is an up and coming company or one that’s not going to make it is critical. This is the news theory. This chart shows the median annual volatility of about 50 countries during the same period—1997 to 2003. The low vol countries are Chile, the UK, Australia, New Zealand, Austria, Canada, etc. 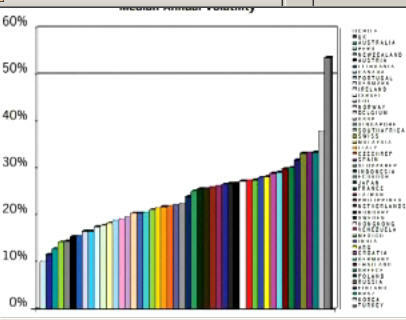 The high vol countries are Turkey, Korea, Brazil, Finland, Russia, etc. I will never be a direct participant in a market where the standard round lot is $1 million, but I nonetheless profited from reading Leveraged Financial Markets: A Comprehensive Guide to High-Yield Bonds, Loans, and Other Instruments by William F. Maxwell and Mark R. Shenkman (McGraw-Hill, 2010). Contributors analyze the major high-yield products, examine alternative credit risk metrics, and suggest ways to trade and manage high-yield assets. They also take the reader into the fascinating worlds of debtor-in-possession financing and distressed investing. Today I’m going to look at a single chapter and a single credit model, Moody’s KMV EDF model, “the most widely used quantitative credit model around the world.” (p. 197) The financial crisis highlighted and called into question the competence of the credit rating agencies. But few of us know how the agencies go about rating the creditworthiness of individual companies. Leveraged Financial Markets provides us with some answers. Credit risk models are designed to measure the probability of default. They fall into two categories: accounting-based, such as the Altman Z-score model, and market-based, such as Moody’s KMV (a company Moody’s acquired in 2002) EDF (expected default frequency) model. The KMV model is grounded in the principle that “a borrower will default if the market value of its assets falls below the value of its debt obligations.” (People who walk away from under-water mortgages exemplify this principle.) The math that informs the model traces its roots to Robert C. Merton’s option pricing model according to which “a borrower’s equity has the same payoff as a call option, where the strike price of the option is equal to the face value of the borrower’s debt.” (p. 201) So the equity will either be worthless or it will be worth the difference between the value of the assets and the debt. The three main drivers of default are asset value, asset volatility, and leverage. The first two drivers are fairly straightforward, but leverage is something of a catch-all. It includes the maturity profile of a borrower’s liabilities where, as homeowners in the old days knew, “a borrower funded with liquid assets and long-term liabilities can avoid default.” (p. 202) The KMV model incorporates this maturity profile in a basic “default point” equation. Default point = short-term liabilities + 50% of long-term liabilities. I suspect that, were we to see the math used in this proprietary model, it would be a lot more sophisticated than the arithmetical description provided here. But at least we now have some idea of how credit rating agencies work. Leveraged Financial Markets is written for investors and managers who want an overview of the high-yield markets. It is broad in scope, yet there is also “meat on the bones.” I think it would be invaluable for anyone thinking about adding leveraged finance to their portfolio or their clients’ portfolios. Mike Bellafiore’s One Good Trade: Inside the Highly Competitive World of Proprietary Trading (Wiley, 2010) outlines what it takes to win in intraday equity trading. His vantage point is prop trading, but most of the book applies equally well to the individual who is trading his own account from home. One Good Trade is not a book of strategies, although it covers tape reading in some detail. Rather, it focuses on preparation, mindset, process, and performance review. Some of the material should be familiar to readers of Brett Steenbarger’s books and his still extant but no longer updated Traderfeed blog. But Bellafiore personalizes his discussions by introducing us to traders at SMB Capital, both successful and failed. Moreover, he provides enough information about SMB’s training program to jump start the education of the person who’s going it alone. I’m going to limit this post to three takeaways from the book. Third, using video to review trades. SMB Capital records traders’ screens for later review. The independent trader using this technique wouldn’t have the benefit of mentor commentary, nor could he compare how he trades a setup to how his peers trade the same setup, so critical feedback would be much more difficult. But if the independent trader knows the kinds of things that tend to trip people up (position sizing, order execution skills, not exiting stocks that trade against them) he can probably improve his bottom line by identifying his own weaknesses. Bellafiore’s book is an inspiration, a kick in the pants, and a learning manual. The reader who puts its tenets into practice may just make one good trade again and again. Ka-ching. Readers who have been following my posts on Graham Jones’s Thrive on Pressure will recall that people who want to develop mental toughness must learn four skills: “staying in control under stress, channeling your motivation to work for you, strengthening your self-belief, and directing your focus to the things that really matter.” Today, in the last post of the series, I’ll look at the skill of focusing on the right things. Of course, in order to focus on anything you have to manage the inevitable distractions. Some are predictable and hence controllable, others—potential derailers--can come out of the blue. You lose connectivity in the middle of a trade or, much worse, you are in a trade during a “flash crash.” (I’m assuming that “the” flash crash will not be a unique event.) How do you stay on track? Jones suggests that you engage in “what ifs,” working out how you would respond to these situations before they happen. The authors propose four qualities of a good scientific model. It is elegant, it contains few arbitrary or adjustable elements, it agrees with and explains all existing observations, and it makes detailed predictions about future observations that can disprove or falsify the model if they are not borne out. In a brief post I can’t possibly do justice to these hypotheses. Perhaps somewhere down the pike I’ll analyze, criticize, tinker around the edges. For now suffice it to say that they should provide a lot of grist for the mill of trading system designers. Let me throw out a few very quick, somewhat telegraphic thoughts. 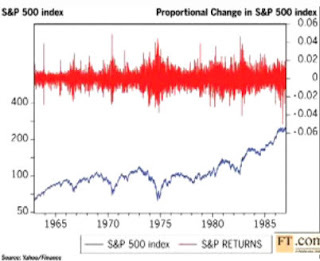 One of my personal bête noirs is the claim that a single system should be applicable across a range of time frames because markets are presumably fractal in nature. This strikes me as an example of intellectual laziness. Do we really think that the programs of successful high-frequency traders are the same as or analogous to those of successful traders who hold equities for a couple of days or weeks? Do we think that those who hedge a portfolio on a daily basis can use the same formulas as those who rejigger their hedges once a month and merely adjust by a factor of 20 or 21? Another question: In testing a system, how long a period should the designer choose and what data set should he use? Which page of the atlas is he focused on? If I want to know how to get from one town in Connecticut to another I’m certainly not going to find the answer on the map displaying all the continents or even on the map of the U.S. A map showing elevations is irrelevant to my needs, a geological map even more so; I don’t even care about rivers and lakes. I need a map (or its digital equivalent) that clearly delineates the highways and byways of Connecticut, preferably with a distance scale. Similarly, if I believe that market action changed when fast money stepped in and the retail investor exited, why would I do a ten-year backtest on an equity trading system? Or if I have devised a system that takes advantage of elevated volatility, why in the world would I test it out in low-volatility environments? Those who have been searching for a monolithic unified theory of trading akin to a unified theory of science should rethink their endeavor. If Hawking and Mlodinow are correct, there is no such animal. Instead, designing systems should be a boutique business. Euan Sinclair set an unattainable goal for himself: he wanted Option Trading: Pricing and Volatility Strategies and Techniques (Wiley, 2010) to be “the only book an intelligent, diligent person would need in order to go from knowing nothing about options to being able to trade professionally at a legitimate trading operation.” (p. xii) Nonetheless this book lays a solid foundation. After a history and introduction to options, the remaining eleven chapter titles indicate the depth and seriousness of Sinclair’s book: arbitrage bounds for option prices, pricing models, the solution of the Black-Scholes-Merton equation, option strategies, volatility estimation, implied volatility, general principles of trading and hedging, market making techniques, volatility trading, expiration trading, and risk management. In two appendixes Sinclair introduces the statistically challenged reader to the concepts of distribution and correlation. It should be noted up front that anyone looking for a math-free option trading book should turn elsewhere. But the reader needs only a decent command of high school math (algebra, logarithms, exponentiation, and calculus) to follow the text, which is laced with formulas—most of them quite simple. I am a firm believer in understanding who’s on the other side of your trade, and Sinclair does an excellent job of portraying both sides of the option market. I also appreciated his “improper” solution of the Black-Scholes-Merton equation and his graphs of the major Greeks as functions of the underlying price. He clearly owes a debt to John Hull’s books, Fundamentals of Futures and Options Markets and Options, Futures and Other Derivatives, and the serious student of options would do well to follow his intellectual trail. Moreover, I am now inspired to go back to Sinclair’s earlier book on volatility trading. There’s never just one book! The Hedgehogs blog is an excellent source for links. Here are two recent ones that caught my fancy. Free access to the top ten most downloaded articles in 2009 from the journal Quantitative Finance. A paper on replicating hedge fund indices with optimization heuristics. Goal setting, Jones writes, is a powerful tool for channeling motivation. These goals should be INSPIRED—an acronym for internalized, nurturing, specific, planned, in your control, reviewed regularly, energizing, and documented. Jones distinguishes three types of goals. First, there is the outcome goal; in the case of a professional golfer it might be winning the tournament. This outcome goal is not under the golfer’s control (however well he played, another golfer may have played better) and so it puts him in a situation of high pressure. Second, there is a performance goal where the golfer might figure that x under par should be a good enough score to win the tournament. And finally, there is the process goal—e.g., stay focused, smooth swing. The second and third goals are under the golfer’s control and ostensibly cause less pressure. Translated into a trading environment, having a winning trade or a series of winning trades is not under the control of the trader. But the trader with a plan figures that he should come out ahead at the end of the day or week. Moreover, every trader should have process goals. These can vary from executing well to knowing when to sit on the sidelines, from cultivating supportive emotions to blocking out distractions. The trader who focuses on performance goals and process goals should be less stressed than the one who focuses on outcome goals. Anthony Crescenzi, senior vice president, market strategist, and portfolio manager at PIMCO, is no mole. He doesn’t divulge the firm’s secrets in The Strategic Bond Investor: Strategies and Tools to Unlock the Power of the Bond Market (McGraw-Hill, 2010). This revised and expanded second edition of the 2002 edition reads more like a textbook than a battle plan. Textbooks are, of course, important educational tools, and were I to teach an elementary course on bonds (perish the thought!) I might seriously consider The Strategic Bond Investor. First of all, I was familiar with almost all of the material covered in the book—and I am decidedly no bond guru. Second, it is well organized and easy to read. The yield curve can see farther into the future than the stock market: “the yield curve predicts economic events roughly 12 months or more in advance, while the stock market is thought to foretell events only 6 to 9 months in advance.” (p. 178) It has outperformed the Conference Board’s index of leading economic indicators, which “sent several incorrect signals in the 1982 to 1990 boom period,” and has either matched or outperformed a set of professional forecasting services. The yield curve’s fortunetelling skills can be fine-tuned by analyzing the magnitude of the inversion. One of the most powerful models for predicting recession four quarters out is the yield curve spread between the 10-year Treasury note and the 3-month T-bill. The results of a Federal Reserve study (Estrella and Mishkin) covering the period 1960 to 1995 link the value of the spread in percentage points to the probability of recession. A positive spread (with values ranging from 1.21 to 0.02) links to probabilities of 5% to 25%. Once the spread turns negative, probabilities go from 30% at a -0.17 reading to 70% at -1.46, 80% at -1.85, and 90% at -2.40. Crescenzi outlines ten factors that affect the shape of the yield curve—monetary policy (the most influential), economic growth, fiscal policy, inflation expectations, the U.S. dollar, flight to quality, credit quality, competition for capital, treasury supply, and portfolio shifts. The savvy market maven will sort through these factors, trying to separate out the technical from the fundamental. The average Joe will probably do just as well by taking the yield curve at face value. Since self-confidence operates in a shorter time horizon, it is important to focus on your recent successes and short-term goals. You want quick wins, however small they may be. These wins will “allow you to build up a store of recent successes that you may wish to record on a small card and carry around with you for use when you need a confidence boost.” (p. 139) You can supplement this focus on accomplishments with other strategies for boosting your self-confidence such as mental rehearsal and positive self-talk. Options books that venture beyond the basics and yet are accessible to non-quants are notoriously difficult to write and sometimes just as difficult to read. Larry Shover’s Trading Options in Turbulent Markets: Mastering Uncertainty through Active Volatility Management (Bloomberg Press, 2010), while not a page turner, is nonetheless eminently readable for the intermediate options trader. No math required. The book is divided into three parts. 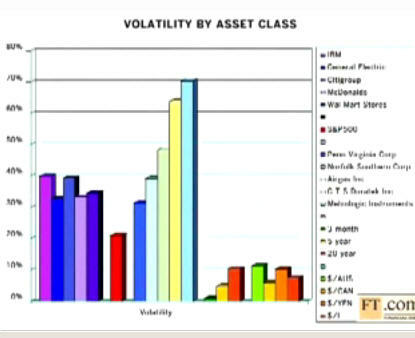 The first part, “Understanding the Relationship between Market Turbulence and Option Volatility,” includes discussions of risk and uncertainty, volatility as an asset class, historical and implied volatility, and volatility skew. The second part of the book explores the relationship between volatility and the Greeks, and the last part offers “Ten Proven Strategies to Employ in Uncertain Times.” The strategies are well known—buy-write (covered call), cash-secured put, married put, collar, straddle and strangle, vertical spread, calendar spread, ratio spread, butterfly, and iron butterfly and condor. But Shover sheds new light by analyzing each trade from the perspective of volatility. Since the author has 25 years of experience trading options his analyses are often “from the trenches.” For instance, in his chapter on volatility and option vega he warns of the consequences of sloppy thinking about volatility. When the Gulf War was looming in January 1991 and UN forces threatened to start bombing Iraq on January 15, implied volatility kept jumping higher. 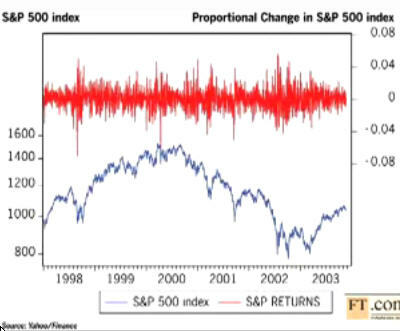 “When the bombs finally dropped, the market saw momentous volatility. Some financial instruments moved a lot, but the implied volatilities of options collapsed quickly. Some people thought they were betting on high actual volatility, when in fact they were really more exposed to implied volatility. They were right on one count and painfully wrong on the other—and in most cases, they lost a great deal of money.” (p. 90) The same reasoning, of course, applies to trading earnings announcements. I have read my share of options books, from the rudimentary to the mind-numbingly advanced. I am very pleased to add Shover’s book to my library. It is a book I’m sure I’ll turn to when I’m stymied by the multi-dimensional world of options trading because it spans theory and practice (and unabashedly over-weights practice). I’m going to summarize Jones’s skills in four separate posts. Quite frankly, stretching out this theme is a way for me to minimize stress. Normally I do most of my reading on weekends, but as I said yesterday Labor Day weekend was not the most productive. I’m behind. Yes, the oats and hairy vetch are planted, but I managed to read only two books, the first of which I reviewed yesterday. (The second review is written and I’ll post it tomorrow.) Upshot: cut me some slack as I enter once again the sometimes smarmy world of self-help. Jones offers three strategies for staying in control under stress: keeping your stress symptoms under control, challenging the thinking that causes you stress, and tackling the sources of your stress. To keep your stress symptoms under control you first have to recognize and record these symptoms—for instance, you might have poor concentration, you might doubt yourself, you might be hesitant to make decisions, you might be low on energy, you might overeat. And then you have to devise a plan to deal with these stress symptoms. There is a wide range of possible strategies, from meditation to lifestyle changes. Your “stinking thinking” can also cause stress. Jones suggests that you identify your typical automatic negative thoughts and learn to stop them. Techniques can be as simple as thought-stopping statements such as “Take control” or imagining a red stop sign. You can also reframe your negative thoughts by asking whether there’s another way to view the situation or by trying to see your “stinking thinking” from the outside. The subtitle of Michael Durbin’s All About High-Frequency Trading (McGraw-Hill, 2010) is The Easy Way to Get Started. Added to the subtitle might have been “if you have wads of money, a team of sophisticated programmers, and clever trading strategies.” This is definitely not a DIY manual for the novice trader. The book is, however, a first-rate description of how high-frequency trading (HFT) fits into general market structure. It also outlines some HFT strategies and presents a balanced account of the debate over HFT. And, as promised in the subtitle, Durbin gets down to the nuts and bolts of building an HFT system in chapters that even I, who spent almost two days over Labor Day weekend resurrecting a very sick computer, could easily understand and thoroughly enjoy. Durbin has a spate of credentials. He worked at Ken Griffin’s Citadel Investment Group and at the Blue Capital Group, and he taught at the business schools of Duke and the University of North Carolina. He is also the author of All About Derivatives (McGraw-Hill, 2005). Durbin writes with facility and wit. Although the book is marketed as a primer, which in many ways it is, it is not dumbed down. The reader learns about elephants and icebergs, volatility arbitrage, and penny jumping as well as about processing off the core, multicasting, and auto hedging. Here I’ll briefly summarize one high-frequency trading strategy—jumping the delta. Options market-makers strive to keep their portfolios delta neutral, but they can rarely lay off the risk of an option trade with another option trade. Instead, they often hedge their trade with the underlying stock. “The market-maker in the underlying stock can use his knowledge of this procedure to his advantage by getting in front of these delta hedges. The basic idea is to watch for large option trades, figure out which side the market-maker is on, calculate the delta of the option trade about to hit the market, and then get in front of it. For example, the stock market-maker sees in the options market data feed a trade ‘print’ for 5,000 put options on stock XYZ. The strike price on those options is roughly the same as the current market price for XYZ stock, so he know this is an at-the-money option, which, by definition, has a delta of around 50. The option trade price was executed near the current offer price for that option, so the stock market-maker can deduce that the options market-maker sold (or wrote) the option.” The option market-maker will have to sell short 250,000 shares of XYZ to hedge the puts he wrote. “Because option market-makers are often willing to pay the market spread, the most common delta hedge order is a market order. The stock market-maker—if he acts very quickly, more quickly than the options market-maker—can whack the $25.50 bid and bid $25.49. When the option hedge order to sell at market arrives, it fills at $25.49 and our lightning-fast stock market-maker gets to buy for $25.49 what he just sold for $25.50.” (pp. 69-70) Whew! That, my friends, is what computers (and brilliant computer programmers) are for. All About High-Frequency Trading should appeal to computer geeks who want to improve their algo trading software and hardware. But it’s a good read for the rest of us as well. I was flabbergasted to realize just how many components are necessary to have an effective HFT system. Without passing judgment on whether HFT is beneficial or detrimental to the markets, I can say unequivocally that it’s not a quick and easy way to get rich. When my dissertation advisor, Rulon Wells, died two years ago, a colleague wrote a tribute describing him as a formidable polymath. That phrase stuck in my mind, so when I encountered Vinnie Mirchandani’s book The New Polymath: Profiles in Compound-Technology Innovations (Wiley, 2010) I figured it was something I had to read. It’s an interesting book, though not essential reading for the trader or investor. Nonetheless, we might all do well to think about these quotations from a chapter late in the book where ten polymaths from history join the discussion. David E. Y. Sarna’s History of Greed: Financial Fraud from Tulip Mania to Bernie Madoff (Wiley, 2010) is a disappointing book. The author transforms a potentially fascinating topic into little more than an annotated laundry list. With the exception of Madoff, to whom he devotes four chapters and some eighty pages, the other varieties of financial fraud get short shrift—on average a mere eight pages each. The book’s cast of villains is also curious in that they are disproportionately Jewish. Sarna is obviously a practicing Jew who is proud of his heritage; he starts the book with his grandmother’s disdain for luftgescheften and luftmenschen. Yet where he could easily illustrate a scam with non-Jews he often goes out of his way to find a Jewish culprit. For instance, boiler rooms are commonly associated with the Russian mafia yet Sarna doesn’t even mention them; instead, he recounts the misdeeds of Stanley Cohen and his family. One of the more convoluted scams deals with manufacturing trading volume. The illustrative tale is based on an actual story but has been “augmented a bit with details from other stories that also all really happened.” Three men were involved—Ken, the promoter; Eli, CEO of “Dreck Minerals”; and Jacob, owner of a day trading operation. The goal was to have sustained trading volume of 150,000 to 200,000 shares a day so that Eli could get his drilling operation funded. Jacob asked Ken for a million shares to run the program and half a million for himself. Ken then asked Eli for two million shares to run the program and half a million to manage the program. Eli agreed to have his cousin Boris in Israel send two and a quarter up front; the shares would come out of the Turks and Caicos Islands. They would go to a bank account held in the name of the First Abyssinian Church of South Carolina. (As Ken explained, “I have a buddy who is a Hasid. He called a buddy of his, a rabbi in South Carolina, and he spoke to the pastor [of the black church], who made it happen for me in the spirit of ecumenism.”) The plot thickens as Ken knows that Eli will sell as much as he can into the volume that Jacob will create; he convinces four traders in Canada to buy and he himself starts to sell short as soon as the price rises. And on the scam goes. Unfortunately, the definitive history of financial fraud has yet to be written. Sarna provides at best a starting point. Berkun sketches some ways to get and stay motivated. Here are three. Most people who use technical indicators have little understanding of what they were intended to do, let alone how they might be “reinvented.” Sometimes it's wise to re-read the literature. In RSI: Logic, Signals & Time Frame Correlation (Traders Press, 2007) Walter J. Baeyens explores alternatives to Welles Wilder’s interpretation of his Relative Strength Index, introduced in New Concepts in Technical Trading Systems (1978). Baeyens’ primary source of inspiration is the method taught by Andrew Cardwell. For those who prefer arithmetic to imagery Baeyens offers a table based on the up/down ratio required to move RSI to a given value. He uses the standard 14 lookback period. Up = (((average up last 13 days) x 13) + value up today)/14; down uses the same formula, simply substituting “down” for “up.” Here are some of the critical 50+ RSI levels and the up/down ratios: RSI = 90: up/down = 10/1; RSI = 80: up/down = 4/1; RSI = 75: up/down = 3/1; RSI = 66.6: up/down = 2/1; RSI = 50; up/down = 1/1. It doesn’t take a mathematical genius to calculate the up/down ratios when RSI is less than 50. 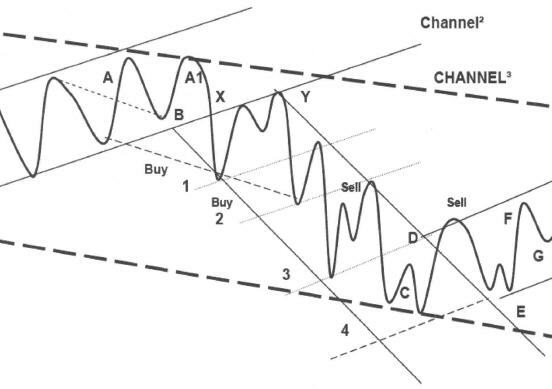 One of Baeyens’ theses is that it is imperative to correlate different RSI time frames such as weekly-daily-hourly or daily-hourly-15-minute “in order to assess the market conditions and anticipate high probability scenarios.” (p. 53) He then does fairly complicated channel analysis on these charts. Baeyens offers the reader a range of scenarios, showing in each case how RSI helps anticipate price movement. The book, some 350 pages long, is full of marked-up charts. I should caution that this is not a book for the trader who wants to automate an RSI system. I have no idea how a programmer could translate the myriad channel lines into code. But it’s an interesting, fresh look at a widely used indicator.